A first time offering from Australian company Showcase Models Australia, the Bushmaster PMV covers a unique vehicle in service with the Australian Army, the British Army and the Royal Netherlands Army (RNLA). Based on an Irish design, the Bushmaster was a result of Project BUSHRANGER from the early 1990s. Once the Bushmaster was selected by the Australian Army after trials in 1998 to meet the Bushranger project requirements, the range of variants was developed further by Thales Australia. The Bushmaster is available in six variants including troop carrier, command vehicle, direct fire support vehicle, assault pioneer vehicle, mortar vehicle and ambulance. The kit is packaged in a sturdy box with "Volstad-esque" box art with a Bushmaster at speed alongside an emu. The box contains 344 parts on 9 sprues and a separate upper hull molded in light gray plastic, 24 thin, crystal clear parts on a single sprue, four hard vinyl tires, a decently sized fret of photoetch (packaged with protective plastic on both sides) and a large decal sheet with marking for four Australian Army vehicles. Molding is crisp and very detailed, with recessed lines, rivet detail and, of note, anti-slip coating convincingly molded into the upper hull of the vehicle. The kit tires, as mentioned earlier, are harder than your average injection molded kit tires. There is a faint mold line that looks to be very easy to remove. The suspension can be positioned either straight ahead, or turned, but it is unclear if the front suspension is fully workable. The interior is fully represented, including troop seating with AUSCAM decals for the seat cushions and photoetch seatbelts. Photoetch is also included for the dashboard, and shelves, storage, etc is all represented in detail. Exterior detail is represented quite well, with a spare tire, cover and camo decal included. Exterior weapons options consist of a single ring mount with mounted MG. The detail on the MG itself looks to be a bit soft when compared to the rest of the kit as a whole. Door hatches and panels can be positioned open to show off much of the interior detail. License plates are in brass with corresponding decals to provide a nice 3D plate. The decals are Cartograf and are thin, within register and very little excess carrier film. As stated above, four vehicles are depicted, including AMTG 2 combat units in Iraq 2005-2006, RAAF airfield security 2007, a 6RAR Operation Acolyte vehicle from 2006, and a Motorised Combat Wing, School of Artillery vehicle from 2005. 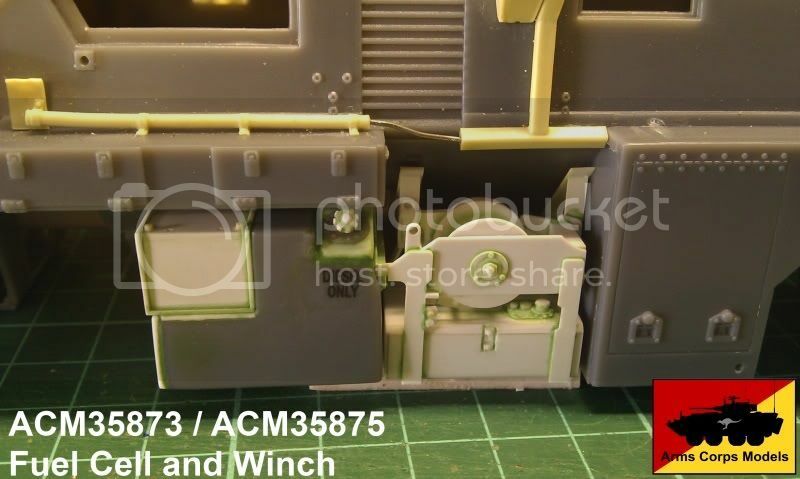 Painting instructions call out the standard Mouse Armour of Black/Green/Tan with Tamiya, Gunze and Model Master callouts. A website is also given that includes a photo gallery walkaround, which one would argue can be used through the entire build of the model. This kit is a great first offering from SMA. Quality molding, crisp detail, clear and concise instructions and excellent decals are all great starting points for this company. Art on the side of the box shows hints of at least two more 1/35 offerings; however, as of August 2012, no further releases have been made. Highs: Interesting subject, great detail throughout, multiple decal markings. Lows: LMG detail is a bit soft, no emu offered (joking, of course). Verdict: A solid first offering that should appeal greatly to AFV/APC buffs and to a wider range of model builders in general. Hey, I was expecting and Emu in mine too! I was a little surprised that the kit was so large, but pleasantly so as it's easier to work with the components that make up the body structure. This will be extra helpful when detailing the kit. I can't wait to see what Jason comes out with, I am certain the sets will excellent. looks good so far,i will follow this build close. This Bushmaster is a very good model. I waited a model of this vehicle for a long time so thank you very much Showcase Models. I'm surpised that the kit is manufactured in China while Showcase models is an australian mark.